Discussion in 'Action Figures' started by Dearth, Jun 5, 2011. Dearth (Nadir) here, otherwise known as Alex Newborn. Well, we've got a brand-new forum with much easier photo capabilities, and I thought I would go through my old 21-page thread and group all my best photos here in a new thread without you guys having to link somewhere else. "Simon Smith and his Amazing Dancing Bear"
I separated the Snowths so they could go on either side, the way they ought to be! Cheesecake munchin' on a cheesecake munchin' on a cheesecake! Say it with me... "Gonzo fiddles while George Burns!" LaniArianna, Muppet fan 123, mbaboon and 1 other person like this. "Fresh outta the pan, sweet gingerbread man!" "I refuse to be treated as a newcomer." "Fine, you will be treated as a LATEcomer!" LaniArianna and Muppet fan 123 like this. Fozzie with press card for his hat, and "Lady Holliday"
LaniArianna, SkeetScootSquat, Muppet fan 123 and 1 other person like this. Some hand-painted vinyl Sesame Street figurines. I did these in 1998, awaiting the birth of my first son. This is why customizers don't buy expensive re-decos of existing molds. Hand-painted by yours truly. Likewise, this is just a Rowlf that I bought in 2010 for $7.50 on eBay, and then spray-painted him white and grey. 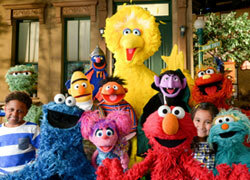 LaniArianna, Muppet fan 123 and newsmanfan like this. Thanks for looking... more to come! The Wedding(s) of Miss Piggy and Kermit the Frog! As always...love them all, Alex! is this where the old thread is moving? Its nice to see all the pictures together in one place! No. That one, which I neglected to specify as mine in the title, can still be used for general discussion of customs and dioramas, and for anyone to showcase their works. This one, though, is more the way I wanted my personal thread to look originally, but the old forum wouldn't allow me the flexibility. So it seemed like the perfect opportunity to start over from the beginning and get things a bit more organized (like grouping the pics in a pseudo-chronological sequence). oh cool, do you have any pictures of where you keep your collection, or how you display them? A photo right now wouldn't be very satisfying. Something akin to asking "Where is the Ark of the Covenant?" only to be shown that warehouse full of crates at the end of Raiders. I'm replacing the ceiling fan over that island, and possibly installing a new air conditioning unit. So at the moment, all of my Muppets and several other toys to boot have been boxed up and relocated to a spare bedroom. oh, thanks, I can't wait to see it, you saw my video right? My internet was acting weird last night... this is the photo of my Muppet collection (and other toys) that I was trying to add, but it kept being a little red X. 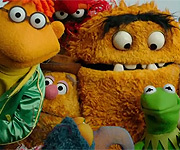 One lil gripe I have, Dearthy... You forgot Robin in the muppet promo poster, he was hanging off Fozzie's shoulder. But it can be forgiven...Since he was cut out, along with Lew's fish..
Also, didn't you recreat that Muppets looking in to the Mallory Gallory for that weirdo member Lamango? I had to go digging to find the version of the poster that inspired me for that group shot... sure enough, it's cropped so there's no Robin. Notice Kermit's head faces forward but his body faces backwards, to give him a more upward eyeline. Amazing what a difference is made by just a slight rotation of the wrist and elbow. I don't have a Tom Servo. Wish I did. I made one for a friend of mine a loooooong time ago, but we had a falling out and haven't spoken in many years. Disastrous audition for "Yes, We Have No Bananas" -- this did not end well. The Lost Guest Star... "Tenk you veddy much!" SkeetScootSquat, Muppet fan 123 and newsmanfan like this. Anyways...Think you could sneak Robin into that picture? I know I'm a pain. But yeah, you can get Servo from box set XVI from Shout Factory. He fits in perfectly. Now, I'm sure you can find a way, you handsome customizer you, to make Crow get off the stand, maybe...MAYBE give him accurate legs. Now...If you redocorated the Pigs in Space Set...BOOM, Satalite of Love! With everything boxed up at the moment, I won't be re-creating the poster to add Robin anytime soon, but maybe someday I'll give it a go. 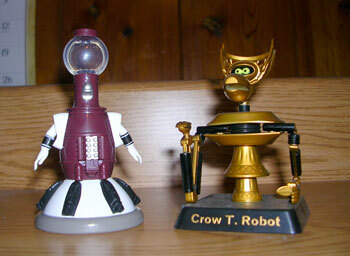 I don't have any of those MST3K figurines, though I've admired them in the past. maybe you could photoshop him in.